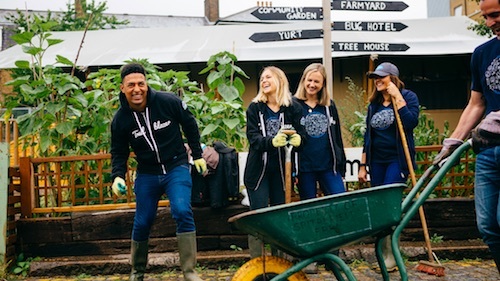 Now more than ever, we are seeing a growing demand for companies to take initiative and tackle challenges in the community and the environment. 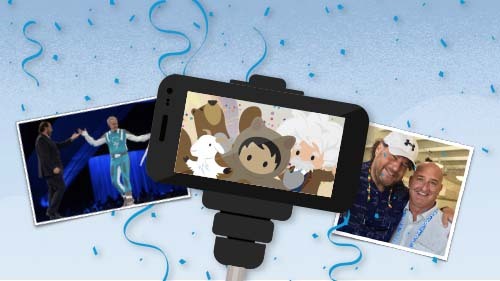 At Salesforce, we believe that business is one of the greatest platforms for change. We are committed to doing our part to step up to the urgent challenge of climate change, ensure a just transition to a low carbon economy and provide a healthy future for all. As a cloud pioneer, we have a heightened responsibility to reach 100% Renewable Energy as data centers run on electricity, which today comes predominantly from burning fossil fuels -- a major source of global greenhouse gas emissions. Since making our first public commitment to 100% Renewable Energy in 2013, we have achieved net-zero greenhouse gas emissions globally, deliver a carbon neutral cloud to all our customers and signed two virtual power purchase agreements (VPPAs). To continue this journey, we are proud to announce our largest renewable energy agreement to date. This virtual power purchase agreement (VPPA) will support 80 megawatts (MW) of new wind energy in Illinois. It is expected to generate enough clean electricity to power more than 27,000 Illinois homes annually and it will create hundreds of full-time jobs during construction and permanent jobs during the life of the project. 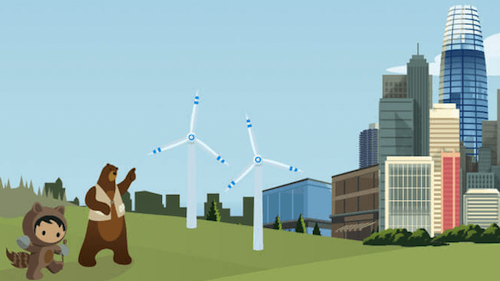 This new project further advances Salesforce's commitment to reaching 100 percent renewable energy by 2022. Of course, our success as a company depends on how much we help our customers and the world to achieve a brighter tomorrow. Our core values of trust, customer success, innovation and equality are critical drivers for our work as we apply them to the urgent issue of climate change globally. As the largest technology employer in San Francisco, we are deeply committed to engaging the community in which our customers and employees live and work. With the Global Climate Action Summit (GCAS), bringing together state and local governments, businesses and citizens from around the world to our hometown, September 12-14, we are taking a pivotal role engaging in the climate conversation and with the community. We have been working diligently to answer the global challenge initiated by Christiana Figueres, Convenor of Mission 2020, to the technology sector to dramatically “step up” climate action and drive down their company’s carbon emissions by 2020. In response to this challenge, I am excited to announce we have organized a diverse group of companies to accelerate climate action within individual businesses, via their value chains and across the global economy. This group of companies are aligning behind a new declaration, and delivering a series of associated commitments that will be announced at GCAS on September 13 at 4pm PT. Stay tuned for more news from that panel! Employee Volunteer Hours: Salesforce employees are committing to more than 1,000 volunteer hours, including an official sponsorship in California Coastal Cleanup day. Ocean Hack: A two-day immersive project to develop solutions that support ocean health. Cal Academy Oceans and Climate Field Trips: Benioff Ocean Initiative and Salesforce are sponsoring 1,000 Bay Area middle school students to visit California Academy of Sciences in September for special ocean and climate programming. This comes on the heels of a teacher-training held in our offices earlier this summer with the Monterey Bay aquarium to integrate climate science into the curriculum. Art Walk in the Park: The Central Plaza at Salesforce Park will transform into a temporary art gallery, open to the public, showcasing artists who use their creativity as a platform to create awareness around global climate issues. The Standing March at City Hall: Renowned French artist JR and Oscar-nominated American filmmaker Darren Aronofsky collaborated on The Standing March, a major public video projection exhibited in Paris during the UN’s COP21 climate conference in 2015. Now, through Salesforce’s leadership, the projection will be displayed on City Hall in San Francisco to remind leaders that the world is watching as they gather at GCAS. We can’t go on this sustainability journey alone. We need everyone to get involved. Head to Trailhead, our online gamified learning platform, and learn how to Create a Sustainable Future. You can also learn about our clean energy strategy here. To learn more about Salesforce environmental initiatives, please visit us at salesforce.com/sustainability.